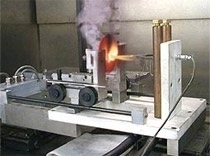 This test is used to determine the glow wire flammability index. _30s of removing the glow wire. b. In addition, the tissue paper underlay beneath the test specimen must not ignite. c. The test specimen does not ignite. 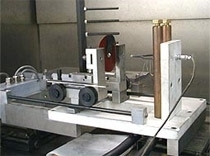 This test is used to determine the glow wire ignitability temperature. The highest temperature at the end of the glow wire at which there is no ignition during the contact time (ignition that lasts for longer than 5s). The glow wire ignition temperature is the temperature that is 25 °C higher (30°C higher if between 900°C and 960°C) than the highest temperature measured at the end of the glow wire. This test is used to determine the flammability of end products. a. No flame formation or no glowing. b. Flames or glowing extinguished within 30s of the glow wire being removed. c. Tissue paper used as underlay does not ignite.